Western Balkans Alumni Association (WBAA) participated at the Connecting Youth Conference in Trieste, held on 11-12 July 2017. All six National Chapters sent a representative and WBAA had a privilege to address the participants before the opening of the official dinner on the first day of the conference. Furthermore, the representatives of the WBAA covered four working groups that were discussing different topics among which were mobility, exchanges, entrepreneurship, inclusion and political participation. The representatives successfully managed to develop a network with CSO and NGO representatives from the region, head of offices of the National Erasmus+ Offices and stakeholders, as well as very friendly European Commission staff. If interested for more information, please contact the volunteers (Marjola Memaj, Jovana Vukcevic, Hristina Ambaroska, Sabahudin Mujkic, Arber Hajrizaj and Stefan Ubiparipovic). 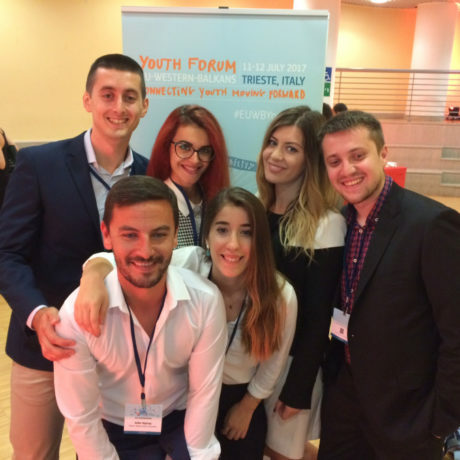 In addition, a short report and conclusions from the conference can be accessed at the following link: EU-WB Youth Forum Trieste 2017 – Conclusions of Working Groups.